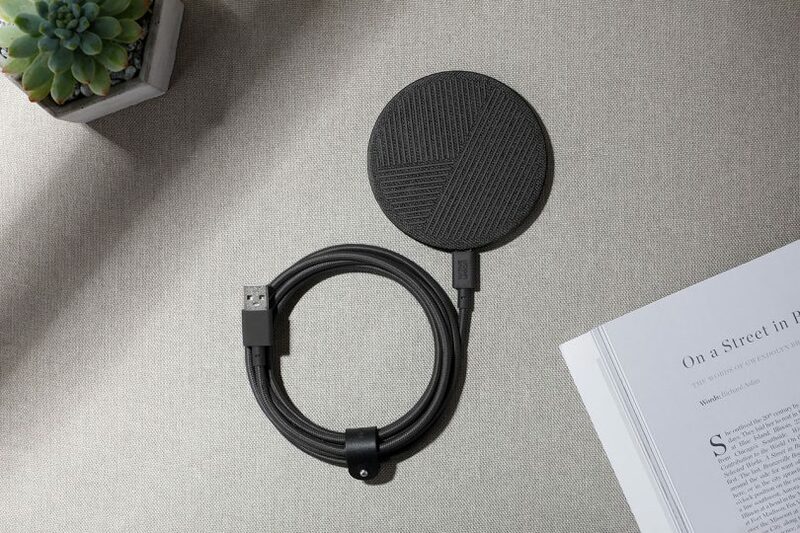 Outfitted in fabric and aluminum, Los Angeles/Hong Kong luxe tech accessorizer Native Union arrives fashionably late to the wireless Qi charger party with a handsomely outfitted Qi wireless charger, the Native Union Drop. Coming off the heels of CES and the recent Maison & Objet in Paris, the LA+HK based Native Union reinforces their reputation as a brand placing design on equal footing with technology, presenting a hard-wearing home textile top integrated with a non-slip silicone tread above an aircraft grade aluminum base – each an aesthetic and functional treatment designed to keep devices in place while also prevent overheating. Underneath the fabric and silicone patterned top, a thermal protection sensor and foreign object detection keeps devices safe while inching back toward 100%.